Summary: July’s trading statement from this medical disinfectants specialist had already signalled these record results. However, the update showed underlying revenue growth of just 7%, with the UK up 3% and overseas up 10%. I’ve therefore had to delve deep into the numbers to ensure TSTL’s main products continue to sell relatively well. At least the company’s accounts and recent acquisition showed more obvious appeal. I must confess, I am nervous comparing the share-price valuation against the medium-term expansion potential, especially with the prospect of sizeable North American revenue as distant as ever. I continue to hold. July’s open-day update had already ensured TSTL’s headline figures would bring no surprises. The annual dividend was lifted 21%, but there was no completing a hat-trick of 3p per share special dividends. TSTL’s cash hoard is instead being earmarked for “earnings enhancing opportunities”. More on those later. Meanwhile, overseas revenue soared 42% for the full year and 41% during the second half. However, the international effort was boosted by currency movements and the purchase of the group’s Australian distributor. One striking line from the management narrative was that, after adjusting for the foreign-exchange gains and acquisition, underlying sales progress for the wider group was just 7%. That 7% figure did not seem too spectacular to me given TSTL’s buoyant share price, so I’ve had to delve into the details to determine exactly how the group performed. I have to admit, there is a mixed picture. On the face of it, the second half was not that impressive for the overseas division. I calculate underlying H2 2017 international revenue gained only £175k — equivalent to an extra 4.5% of the £3,845k revenue that the division produced during H2 2016. For 2017 as a whole, the additional £676k represented an underlying 10% advance. I think many shareholders — including me — had been expecting greater overseas growth. That said, the sums do improve if I exclude TSTL’s overseas distributors from the calculations and assume the £676k was produced entirely by the group’s in-house foreign operations. (Management remarks at the investor presentation suggested TSTL engages with about a dozen worthwhile foreign distributors, as well as about 20 other distributors where the time and effort required is becoming somewhat debatable. The combined effort of the distributors produced flat revenue for 2017, which was all recorded in GBP and therefore not bolstered by currency movements). From this perspective, the aforementioned extra revenue of £676k represents a more attractive 17% of last year’s £4,060k in-house overseas revenue. The 8% second-half improvement (£175k / £2,289k) is a tad more reassuring, too. It’s worth remembering TSTL’s revenue comes from a mix of lucrative ‘core’ disinfectants, demand for which has been growing well, and a significant batch of hum-drum ‘legacy’ products, demand for which appears to be static or falling. ‘Core’ represents the backbone of TSTL’s business — that is, all the patent-protected foams, wipes and solutions that disinfect small medical devices. Everything else — the group’s commodity products as well as the disinfectants for hospital surfaces, veterinary surgeries and pharmaceutical cleanrooms — is classed as ‘other’. You can see ‘core’ UK revenue grew an impressive 16% during 2017 and a credible 5% during H2. TSTL has regularly claimed the UK is a mature market, but the company does seem able to squeeze out additional domestic sales every year. However, I am not anticipating the ‘core’ UK products to deliver more than 5% annual revenue growth during the years ahead. Meanwhile, foreign sales of ‘core’ products gained 57% for the year and 51% for H2. I therefore estimate the underlying international growth rate — that is, adjusted for currency movements and the Australian acquisition — to be somewhere between 12% and 14%. A notable feature of these 2017 results was the impact of TSTL’s Australian acquisition. TSTL purchased its Australian distributor during August 2016 for £1.1m and the results narrative claimed the deal contributed incremental pre-tax profit of £824k. The purchase seemed remarkably lucrative and straightforward for TSTL — for a seemingly low price, the company simply captured the sizeable profit the Australian outfit had previously enjoyed as a distributor. Management comments at the investor presentation indicated the integration and subsequent performance of the new Australian subsidiary had all gone to plan. The executives were surprisingly open about buying other distributors, too. There was talk at the presentation of “several ideal acquisition targets” and, if I recall correctly, the Far East and France were cited. If the initial returns from Australia are anything to go by, I would welcome TSTL spending its cash hoard on other significant distributors. One or two snippets were given by management about North America during the investor presentation. I was pleased the delay with the EPA was explained. The EPA had apparently agreed months ago with TSTL that the company did not have to submit data on citric acid with its product application. However, following TSTL submitting its application, the EPA then declared the citric-acid information was needed after all. TSTL will submit a revised product application by 15 November and an EPA decision is expected during May 2018. During the investor presentation, management sidestepped a good question about the revenue potential of the lighter-regulated EPA-approved products versus the heavier-regulated FDA-approved products. Product approval from the FDA — which I feel is the real milestone event that could lead to substantial US revenue — was said to be achievable “within three years”. I have to say, FDA approval during 2020 does seem a long time away. TSTL first disclosed it was working towards an FDA application in 2015. I should add that TSTL maintains it is on track to produce its first North American revenue during the year to 30 June 2019. I continue to believe that projection means very little, as it could be achieved by earning $1 on 30 June 2019. The projection may mean even less if the $1 earned is Canadian rather than American. The costs of the North American project are still the same, with £500k spent during the 2017 financial year and £800k to be expensed during the 2018 financial year. The investor presentation divulged a few titbits about MobileODT and its mobile colposcope. I was not sure what to make of the fact that TSTL’s chairman and another non-exec acquired 6% of MobileODT at the same time TSTL acquired 3%. On the one hand, I suppose the directors’ personal investments indicate MobileODT has some promise. But on the other hand, why did TSTL purchase only 3% (for £589k) when two directors were buying 6% between them? I’d have thought TSTL had the deeper pockets. The MobileODT colposcope is FDA-approved and is being used in the US, and I asked at the presentation how the device was being disinfected ahead of a TSTL product being given an EPA approval. I was told the colposcope was not being disinfected. I think it’s rather odd that MobileODT, which apparently had the foresight to consider product disinfection and link up with TSTL, is currently happy to see its colposcopes used in the States without proper cleaning. I trust TSTL can discover further mobile medical devices its products can disinfect. “We continue to believe that we can grow sales in the range of 10% to 15% per annum as an annual average over the three years ending 30 June 2019. Both aims currently appear very achievable to me. For one thing, it is important to realise the 10% to 15% sales growth target is an annual average. Therefore 2019 revenue has to reach only £22.8m — or gain just 6% both this year and next — for the top line to have compounded at the low end of the range. I asked management at the presentation about whether the aforementioned 10% underlying revenue growth for international was representative of what could be expected during the next few years. I did not receive a straight answer. There was no straight answer to my question about UK prospects either. All told, I formed the impression that TSTL may not be delivering 10%-15% organic revenue growth this year and next. The 17.5% margin goal does not look too hard to achieve, either. The pre-tax margin was 20% during 2017 and for 2018, a full-year contribution from the Australian division ought to entirely offset the additional costs from the US regulatory venture. Mind you, the executives did mention during the investor presentation that the gross margin was likely to be trimmed during 2018 as supply costs increased. But a similar worry was expressed by the board this time last year, and yet the gross margin improved from 73% to 77%. I can’t really complain about TSTL’s accounts. During the last five years, total expenditure on tangible and intangible assets has been covered by the combined depreciation and amortisation charge levied against earnings. Meanwhile, the aggregate working-capital movement shows a small inflow of cash — which is quite remarkable given the expansion of the wider business since 2013. Even though the generous cash flow funded a total £2.9m spent on the Australian purchase, the MobileODT investment and a 3p per share special dividend, the year-end cash position was left only £0.7m lighter at £5.1m. Management revealed the latest cash position to be £5.8m (equivalent to 13.5p per share). The balance sheet continues to carry no debt and no pension obligations. Returns on equity still run at very acceptable levels, too. I’ve written for some time now that TSTL’s share price expects great things from North America. Taking the 2017 operating profit of £3.9m and adding back the US regulatory expenditure of £0.5m, and then applying tax at the standard 19% UK rate, I arrive at earnings of £3.6m or 8.4p per share. Subtracting the latest cash position of 13.5p per share from the 260p share price, the underlying trailing P/E comes to about 246p/8.4p = 30. That multiple certainly seems optimistic, especially as the group’s underlying growth rate last year was not that spectacular at 7%. 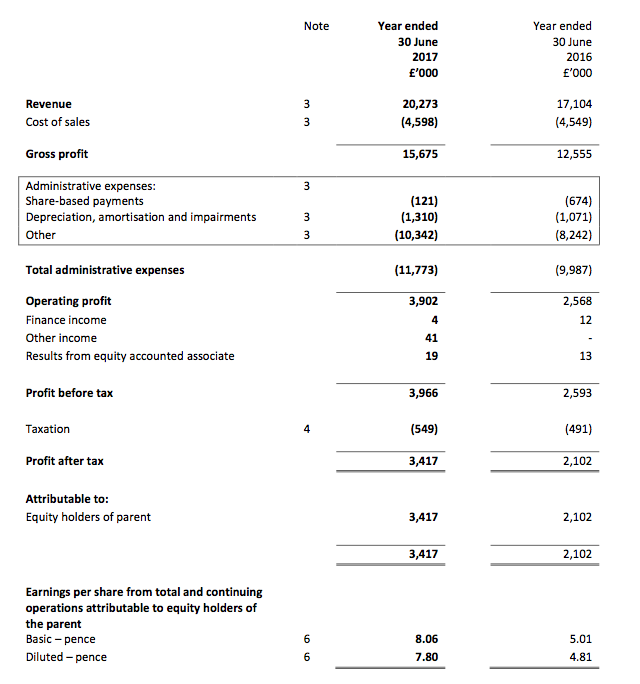 Assuming TSTL’s revenue reaches the £26m top-end of the group’s 2019 guidance and the operating margin (ignoring North American costs) is sustained above the projected 17.5% at 20%, I arrive at a 10p per share earnings guess. That 10p per share guess would bring the possible 2019 underlying P/E down to about 25 — still a rich multiple and one that exposes the share price to potential problems while the North American venture remains stuck in the development stage. I sold 21% of my TSTL holding last month at 289p because I thought better medium-term opportunities lay elsewhere in my portfolio. I might sell some more shares, too. Sure, I was quite impressed by TSTL’s open-day presentation and the potential for the group’s projects in the United States. Furthermore, the disinfectants enjoy ‘repeat-purchase’ characteristics and the accounts remain in excellent shape. However, I do have the nagging doubt that underlying progress may not be brilliant during the next year or two. I also have to remind myself that it may be 2020 at the very earliest before any material US revenue is produced. Disclosure: Maynard owns shares in Tristel. This entry was posted in My Shares, Tristel and tagged Tristel, TSTL on October 25, 2017 by Maynard Paton. This reads as if the £0.4m “exceptional performance-related bonus” is a one-off, but the staff collected a similar £0.55m payment during 2016. TSTL took on 12 extra employees, 5 of whom joined following the Australian purchase. Revenue per employee, up from £173k to £183k, is a new record. Cost per employee was £52k, which is about the same as last year if you adjust for the large share-based payment recorded during 2016. Employee costs as a proportion of revenue was 28%, which is at the lower end of the 28%-34% band seen since 2011. But I see their potential bonus for 2018 (and presumably beyond) has now been raised from 50% to 100% of basic salary. The non-exec chairman (and 20% shareholder) is not paid. At least these options will be based on “share-price performance“. Let’s hope these options are granted both properly and transparently — 1.2 million options were granted against company policy during 2015 (see point 3) and the vesting conditions were not disclosed fully. Year-end inventory has increased by just £313k during the last five years, while revenue has climbed by £9m. That is extremely good stock control. Trade and other receivables of £3,178k represent 16% of revenue, which compares well to the 18% to 24% seen since 2010. You could argue the receivables that are ‘past due’ at 30% of the £3,178k are not low — but the relative amounts are small and TSTL’s history of bad debts is minor. On a broader front I would love to know if a buyer is waiting in the wings following US approval. I for one would be sad to see it happen as I think the team can take Tristel to even bigger and better things. To do that they will need to keep their A Team and the Options will help. Another excellent and detailed analysis. The one point I would make is that I think that far too much focus is being put on the impact of sales in the North American market – and I agree that the complete lack of guidance as to the level of revenue generation figures in 2018/19 makes that analysis a complete guess. I was pleased to hear PS say at the start of the presentation last week that there are significant growth opportunities outside North America that the company will focus on. I actually suspect that those opportunities are in the main much easier to convert than North America and that is where I see the obvious growth. It is a roll out. As a shareholder, I would be happy if Tristel used the cash that they have to develop those other markets rather than pay dividends (difficult balance) and I have made that point to them. Buying in distributorship arrangements should increase profit margins and makes sense to me, but organic growth is the real test. I recall that Hong Kong was specifically mentioned as an area where operations were likely to be taken in house in the near future. Thanks, again, for your thorough analysis. I think I learned from you that the directors would be entitled to another bonus if the company were to be sold in a couple of years time? The continuing delay in the US might make this less likely? Following the forewarning within the annual report (see point 3), the directors have awarded themselves more options. Tristel plc (AIM: TSTL), the manufacturer of infection prevention and contamination control products, intends, subject to shareholder approval, to implement a Performance Share Plan to commence in 2018 (the “2018 Scheme”). Paul Swinney (CEO), Elizabeth Dixon (Finance Director), Paul Barnes (Non-Executive Director), and David Orr (Non-Executive Director) will be eligible to participate in the Scheme. These individuals will be granted options over an aggregate of 990,000 ordinary shares and the exercise price will be 1 penny. This proposal will be presented as an Ordinary Resolution to the Company’s Annual General Meeting. This is to be held at 10am on 12 December 2017 at the Company’s headquarters in Snailwell, Suffolk. In August 2015, ten members of Tristel’s management team, including Paul Swinney and Elizabeth Dixon, participated in the Tristel plc Performance Share Plan 2015 (the “2015 Scheme”). The 2015 Scheme granted an aggregate of 1,201,017 options with a 1 penny exercise price to the participants. On 4 August 2015, the date the 2015 Scheme was announced, the Company’s share price was 96 pence. The objectives of the 2015 Scheme were to grow the Company’s profits and share price over the three-year period to June 2018. The vesting conditions were linked to certain profit objectives being met, or the share price of the Company being equal to or greater than 134 pence for a period of 30 consecutive dealing days. The latter condition was achieved on 6 January 2016, and the options vested on that date. As at 1 November2017, 984,635 of the options vested under the 2015 Scheme remain unexercised which includes those held by Paul Swinney and Elizabeth Dixon. Between 4 August 2015 and 1 November 2017, the Company’s share price has increased from 96 pence to 275 pence, and the Company’s market capitalisation has increased from £40 million to £118 million. The Board considers that the 2015 Scheme has successfully met its objectives. * David Orr 45,000 options. * One-third will vest upon the achievement of a share price of £5.00. In the event of a change of control of the Company all options will vest. Any vested but unexercised options will expire on 30 June 2021. As an additional condition, the options will only be exercisable if the holder commits to hold the resulting ordinary shares until 30 June 2021 or, if sooner, until a change of control of the Company occurs. If the 2018 Scheme is approved, the aggregate number of options outstanding will be 4,020,585, representing 9.4% of the Company’s existing issued share capital. * Unlike the 2015 scheme, this 2018 scheme is to be put to shareholders via an AGM resolution. I welcome that decision and at least shareholders can have their say on the new scheme’s merits. * I see two non-execs, Paul Barnes and David Orr, are set to receive some options. Both of these non-execs are on the remuneration committee, with David Orr being the rem-comm chairman. I dare say it probably wasn’t a hard decision for the rem-comm to propose this 2018 scheme. I presume Francisco Soler, the non-exec chairman, calculated the option grants. Mr Soler is not participating in this new scheme. * The annual report states the non-execs do not “participate in any of the bonus schemes“. I suppose “bonus schemes” refers to the annual bonus based on salaries rather than option grants. So less than two years after the 2015 scheme issued 1.2 million options, we now have the 2018 scheme with a further 1 million options. It’s a good job the business has done well and the share price has risen to allow shareholders perhaps to forget what was said about another LTIP. * At least these options are based on decent share-price performance gains, which unlike EPS etc can’t really be fudged by accounting tricks. I will be happy if the price is £5 by 30 June 2021. * References to “change of control” were somewhat prominent within the statement, although options usually come good when takeovers occur anyway. TSTL’s annual reports have for some years listed certain executive options that become exercisable on a “change of control” (they expire in 2019 and 2024) and I do get the impression a takeover will occur at some point. Something to ponder, however, is that the “change of control” options listed in the annual report have an exercise price of 65p — which reflected the share price at the time of grant. This 2018 batch will have an exercise price of just 1p. So the business could be sold for peanuts, yet the directors will remain quids in while shareholders are mugged. Tristel plc (AIM: TSTL), the manufacturer of infection prevention, contamination control and hygiene products, will hold its Annual General Meeting today at 10am at Lynx Business Park, Fordham Road, Snailwell, Newmarket, Cambridgeshire CB8 7NY. “We are delighted that once again we expect to report period-on-period profit growth for the six months to 31 December 2017. “We expect unaudited pre-tax profit for the first half to be no less than £1.9 million, compared to £1.7 million for the same period last year. Both figures are before share-based payments. Tristel continues to perform in line with management’s expectations and our strategic financial goals. The Company’s unaudited interim results will be announced on Tuesday 20 February 2018. Going from £1.7m to £1.9m equates to almost 12% growth. However, bear in mind TSTL is expensing its US regulatory costs. For H1 2017, the cost was £200k. For the current full year (to June 2018), the group’s projected US charge is £800k. So perhaps £300k of US regulatory costs was/will be expensed in this H1 2018. So on a pre-US, pre-share-based-payment basis, going from £1.9m to £2.2m is close to 16% growth. Plus, last year’s AGM statement said H1 2017 pre-tax profit would be “no less than £1.6m“. In the event the figure was £1,706k. I am hopeful the same £0.1m element of ‘sand-bagging’ has occurred this year. If it has, then going from £1.9m to £2.3m equates to 21% growth — before US costs and share-based payments. Not bad. No mention of revenue in the statement I see. An RNS that adds to TSTL’s collection of peer-reviewed studies. I can’t recall other similar ‘study’ RNSs referring to other products and suppliers. This RNS mentions Rapicide and its owner, Cantel, which TSTL says is “one of the world’s largest dedicated infection prevention companies quoted on the NYSE“. This could all be wishful thinking on my part. But it would not surprise me if TSTL is acquired by the likes of Cantel at some point. TSTL’s chairman/major shareholder has a history of selling businesses and certain options granted to the executives come good *only* if the business is acquired — which is very unusual. Mentioning large US rivals within RNSs may be trying to sow a seed in shareholders’ minds, and being acquired could be an easier option for the executives than trying to establish TSTL in the US by themselves. “Tristel plc (AIM: TSTL), the manufacturer of infection prevention products, announces that a study conducted at the Khoo Tech Puat Hospital, Singapore, has concluded that the Tristel Wipe has comparable efficacy to a world leading peracetic acid high-level disinfectant (Rapicide; Cantel Medical, New Jersey, USA), and provides significant other advantages to a hospital. The study has been published in the International Journal of Otorhinolaryngology and Head and Neck Surgery (Gan YJ et al. Int J. Otorhinolaryngol Head Neck Surg. 2018 Jan; 4(1):18-23). Cantel is one of the world’s largest dedicated infection prevention companies quoted on the NYSE. The study took place in the Ear, Nose and Throat clinic during 2014. One hundred patients volunteered to participate and for each endoscopic examination one nasendoscope disinfected by Rapicide and one nasendoscope disinfected by a Tristel Wipe was used to scope each nasal passage of the patient. From swabbing each nasendoscope pre and post disinfection to reveal evidence of bacterial contamination the study concludes that Rapicide and the Tristel Wipe are statistically equivalent in terms of efficacy. In addition to being comparable with Rapicide the study identifies other significant advantages of the Tristel Wipe. These benefits are rapid turnaround of the nasendoscope (2-3 minutes for Tristel versus 20 minutes for Rapicide) which means the clinic can see more patients in a day with fewer nasendoscopes; Tristel’s safety from a health standpoint, and the Tristel Wipe’s portability which means that it can be easily taken to the emergency department or to the wards. This is important as even though most ENT departments are out-patient areas, frequently in-patients carry MRSA, vancomycin-resistant Enterococci (VRE), and even tuberculosis, and need to have a nasendoscopy. The Tristel Wipe can easily be taken to them to enable the examination. The Tristel Wipes System is a unique, patented decontamination method for non-lumened endoscopes and ultrasound probes. It has been a very significant sales success for the Company globally. Worldwide sales of the Wipes System in the financial year ending June 2017 were £11.5m.